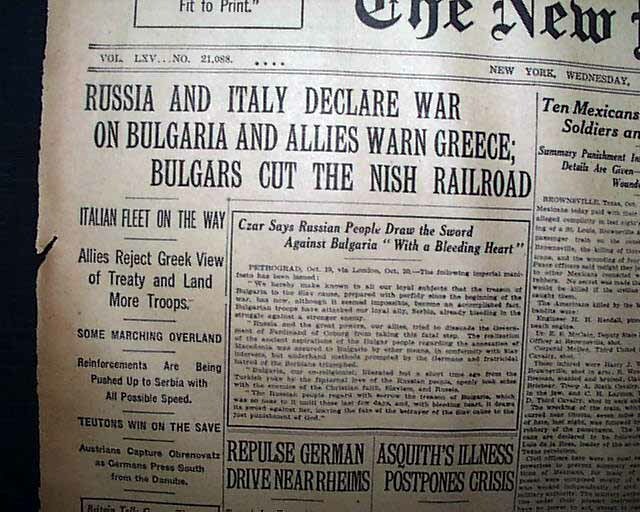 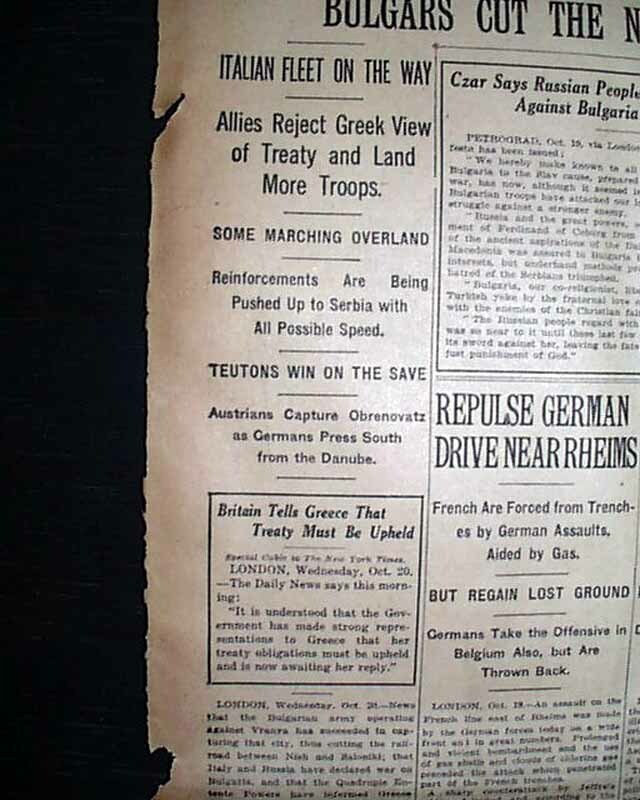 THE NEW YORK TIMES, October 20, 1915 The front page has a three-column, three-line headline "Russia and Italy Declare War on Bulgaria and Allies Warn Greece; Bulgars Cut the Nish Railroad" with subheads "Italian Fleet on the Way " "Allies Reject Greek View of Treaty and Land More Troops" "Some Marching overland" and more. 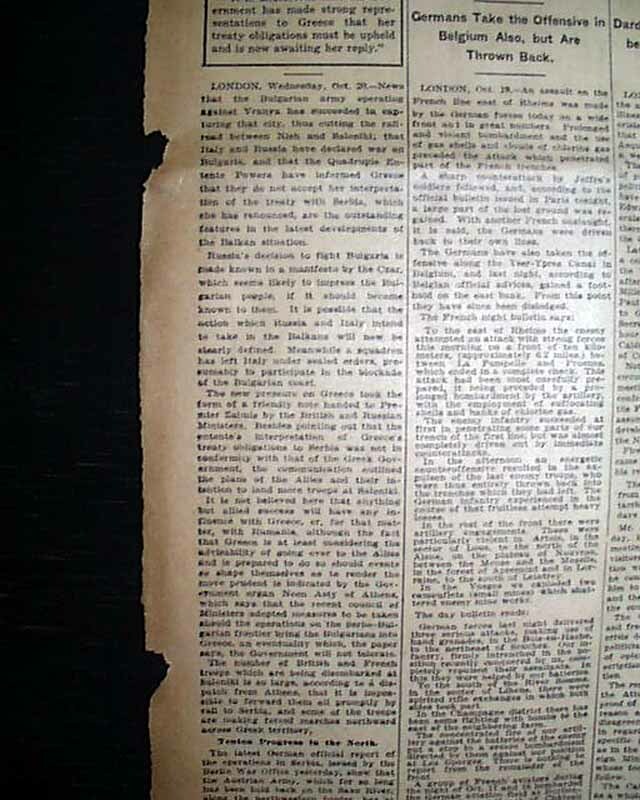 There are additional articles as well. 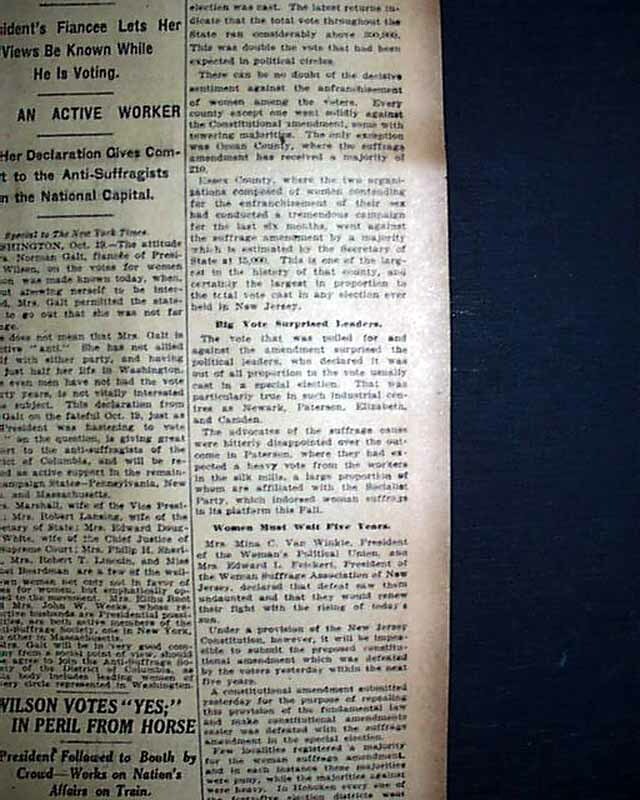 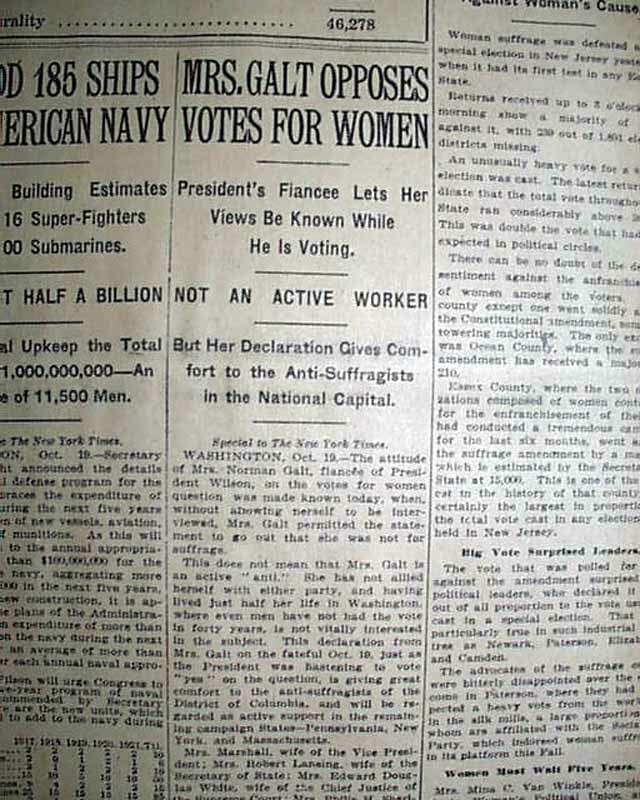 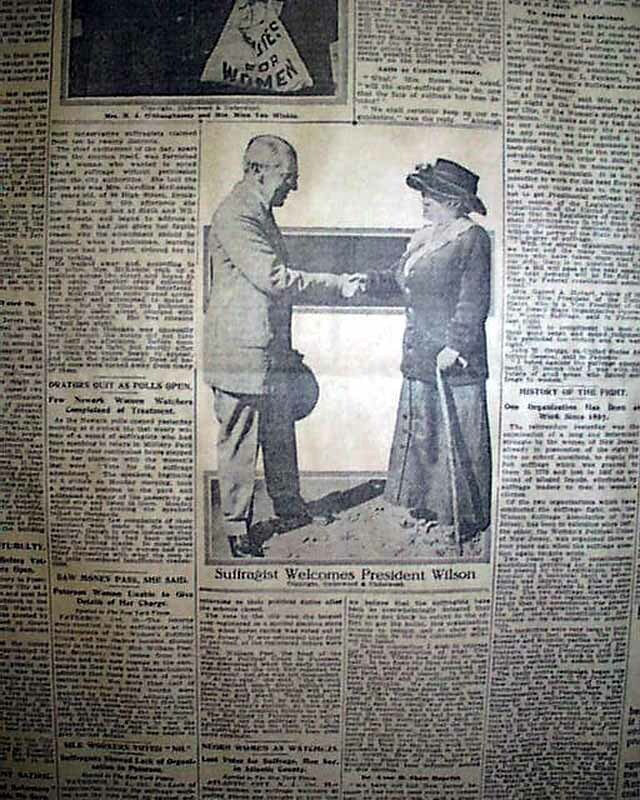 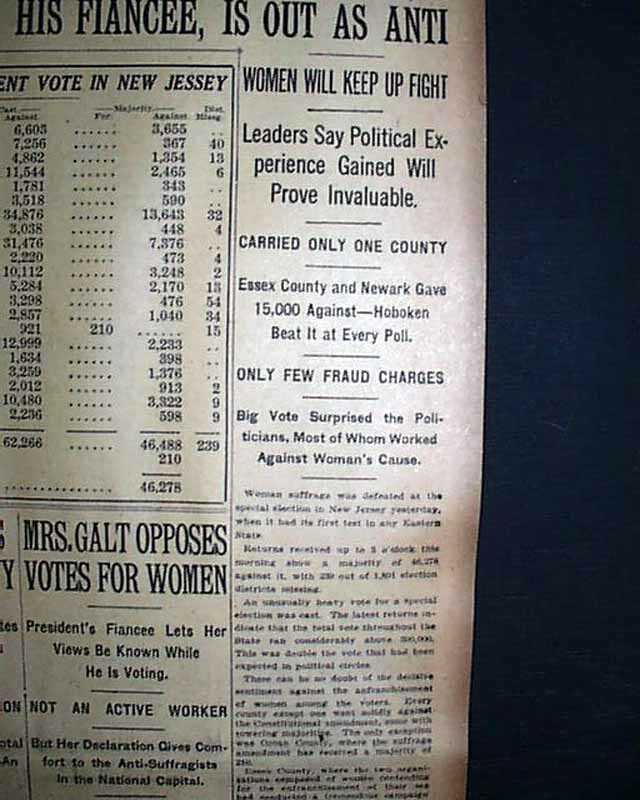 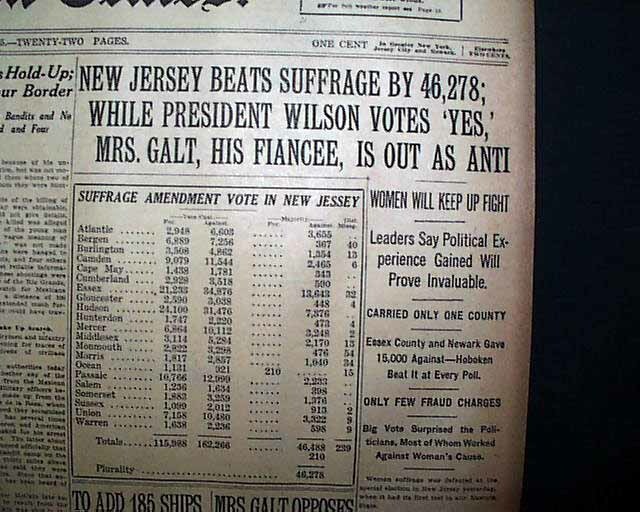 Also on the front page is a three-column, three-line headline "New Jersey Beats Suffrage by 46,278; While President Wilson Votes 'Yes,' Mrs. Galt, His Fiancee, is Out as Anti" with subhead "Women Will keep up Fight" "Leaders Say Political Experience Gained Will Prove Invaluable" and more. 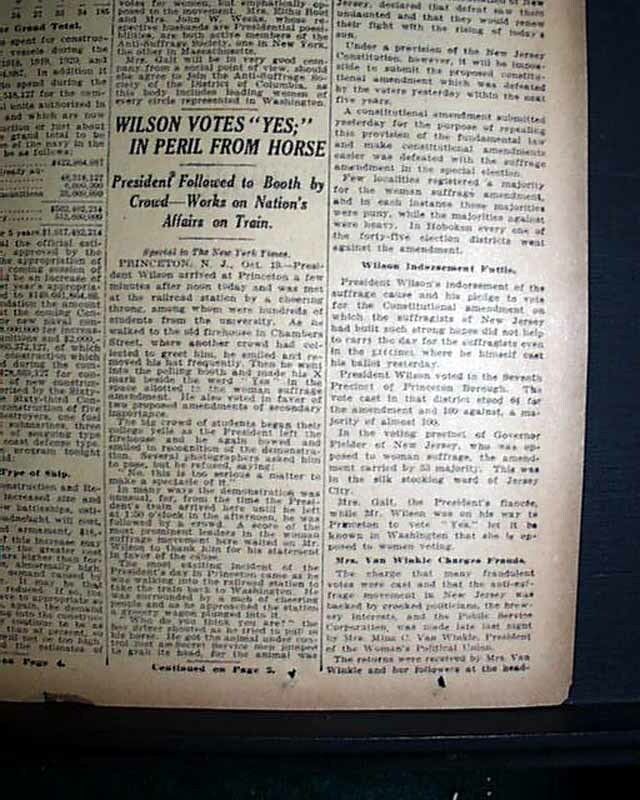 Additional articles are "Mrs. Galt Opposes Votes For Women" and "WilsonVotes 'Yes;' In Peril From Horse". 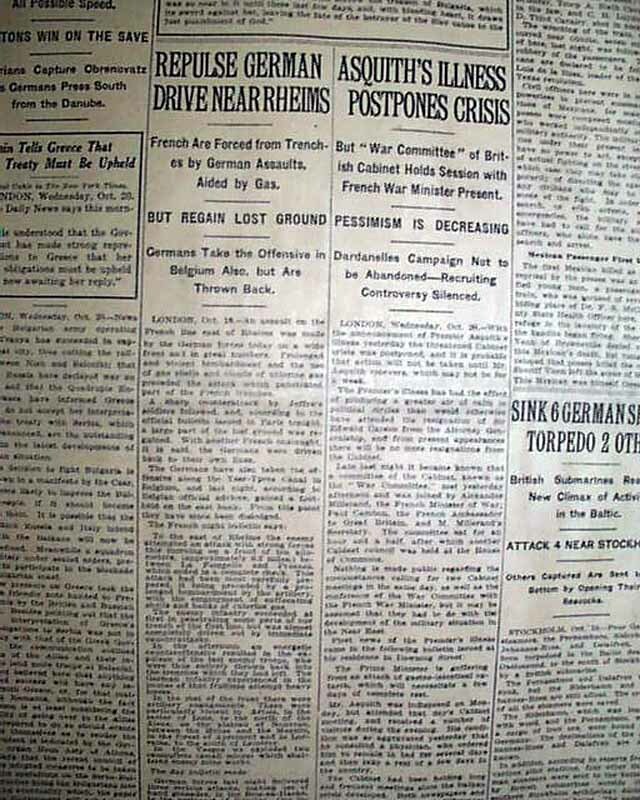 Additional coverage inside the issue. 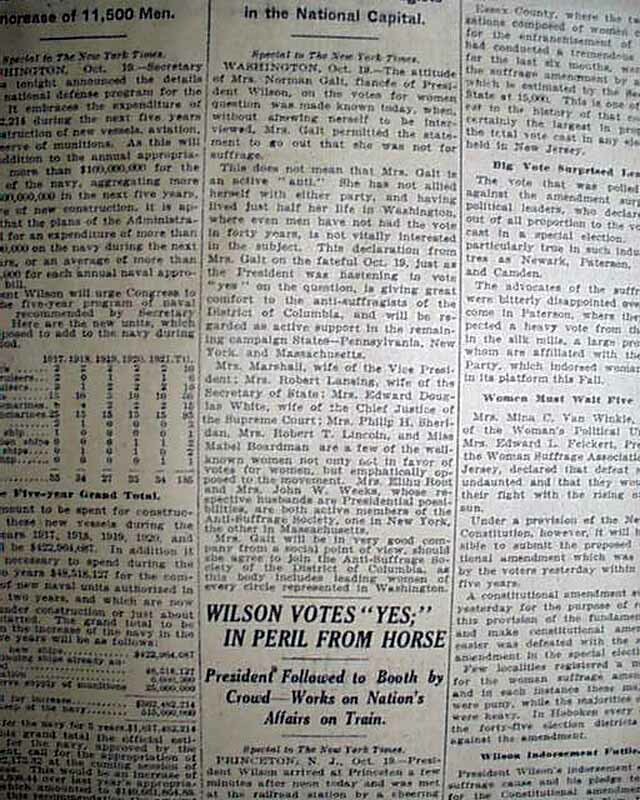 More news of the day, sports and advertisements are within. 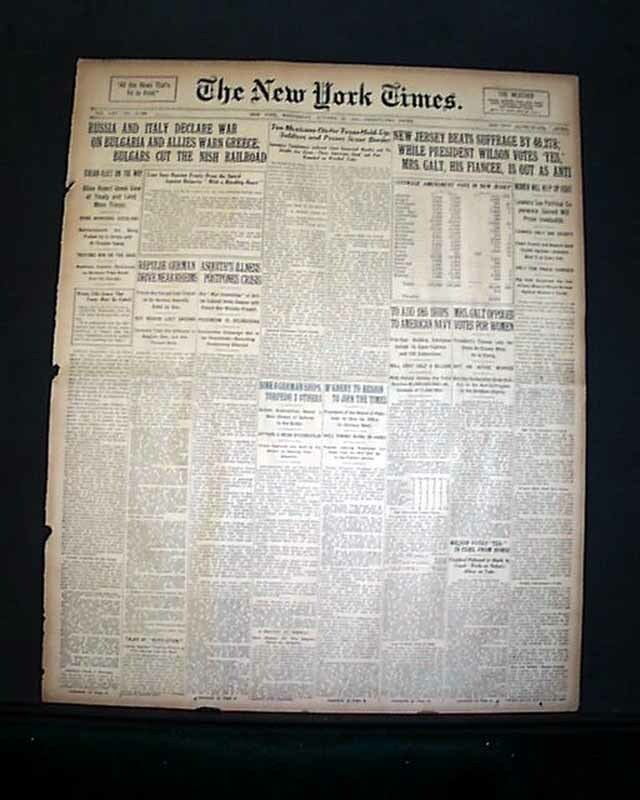 Complete in 22 pages with a few small binding slits along the left spine, otherwise in good condition. 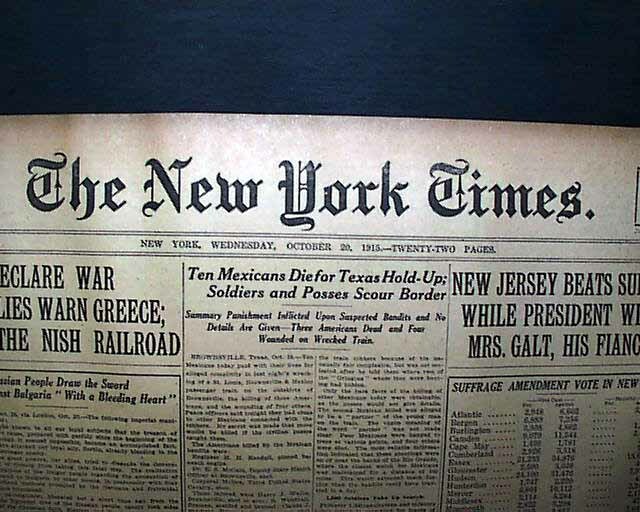 Should be handled with some care.